Tell Me Something Good logo. Image by Lenny Ghoul and Word Clouds. The news these days is often depressing at worst and frustrating at best. It’s easy to get caught up in the spin cycle and let it get us down. Never fear… The News Blender has you covered. Once a week we feature Something Good and, in return, all you have to do is tell us something good that has happened to you this week, something you are thankful for, a joke, a cute animal story, an inspiring tale of heroics, a Random Act of Kindness… SOMETHING good. Today we have more teenagers across the country doing good for others. In Caldwell, Idaho, a group of boys on their way to play basketball saw an elderly man named Jose Gomez fall. Victor Ornelas, Isaac Hernandez, Diego Ramirez, Devan Ornelas, and Josh Sorg parked and jumped out to aid Jose. They picked him up, walked home with him, helped him inside, and treated his bloody knee. A Facebook post with pictures of the boys helping Jose went viral in the small Idaho community and the boys were showered with small town appreciation – cupcakes, cookies, lunches, and haircuts. “Crazy how it blew up. We didn’t do it for the attention, we just did it out of the kindness of our hearts. It’s just the right thing to do,” Isaac Hernandez said of the outpouring of pride. Another group of teenagers in New Jersey, showed kindness to a little boy with autism. On March 26, Kristen Braconi posted a video of the teenagers and her son Carter on Facebook. So often teenagers are viewed as rude, lazy, and self-centered but they are as likely to be polite, hardworking, and giving as any other age group. These kids are a credit to their communities and the county and they are certainly Something Good. 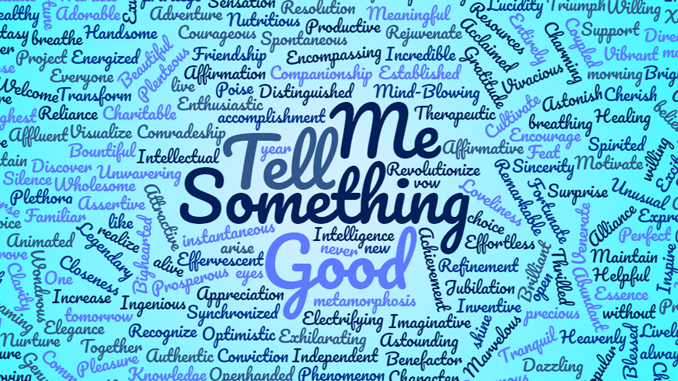 Now it’s your turn… Tell me something good!